Preity Zinta Talks About Love And Life After Getting Married! 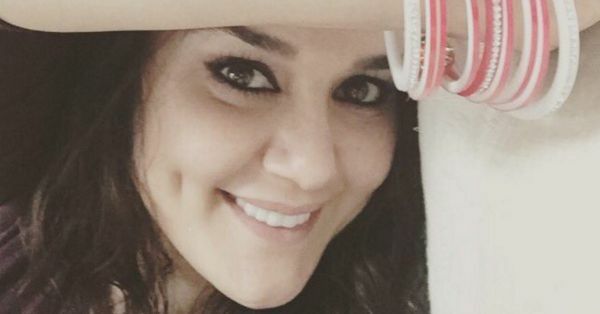 Preity Zinta hosted a Q&A session on Twitter two days ago and she finally talked about a lot of things we had been wondering about since her wedding. So here are some of the revelations from the session! 1. The "Goodenough" jokes she made when asked about her husband... 2. When asked about her plans to visit India... 3. The hilarious way in which she responded to her fans congratulating her! 4. Her totally logical answer when she was questioned about the "secrecy" around her wedding... 5. Oh and she's full of marriage jokes! Like when she was asked if she'll attend IPL... 6. And when she was asked about her honeymoon plans! 7. When she was asked about her relocation plans... 8. And of course, her fans joined in on the "Goodenough" jokes! 9. And her hopes of spending some time at the IPL with her husband! Images: Preity Zinta on Twitter MUST-READ: What You Need To Know About Urmila Matondkar’s Secret Wedding! 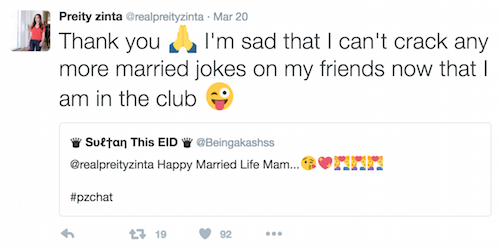 MUST-READ: Durjoy Datta’s EPIC Proposal Led To An Even Better Wedding! !